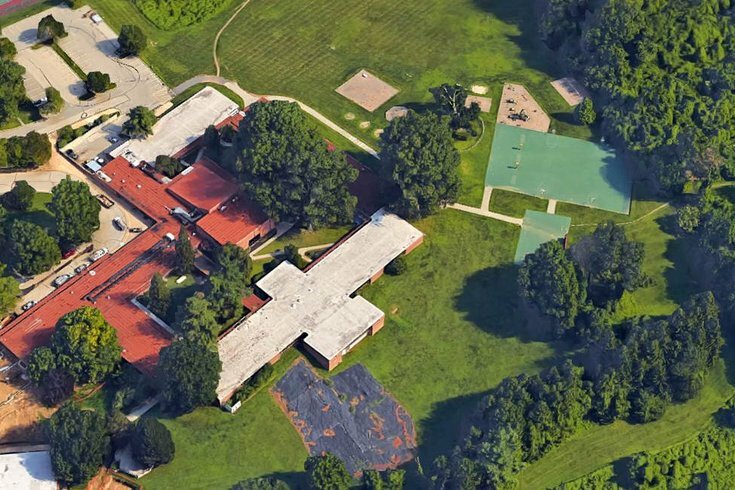 An overhead view of Ithan Elementary School in Bryn Mawr, showing the school's proximity to a stretch of woods at the rear of the property. On Tuesday morning, a black bear was sighted in the woods, the second time in the past few days a bear was spotted in Radnor Township. Officials from the Radnor police and Pennsylvania Game Commission could not locate the black bear that had been seen Tuesday morning near a Delaware County elementary school, prompting a low-level lockdown at the school for most of the day. It was the second time a black bear had been spotted in Radnor since Saturday, authorities said. The precautionary measures went into effect at Ithan Elementary School, 695 Clyde Road in the township's Bryn Mawr section, not long at students had arrived for class Tuesday according to a statement posted on the school's website. At the request of the Radnor Township Police department and in an abundance of caution, Ithan Elementary School was placed in a Level 1 Lockdown around 9:50 a.m. today, Sept. 13, due to reports that a bear was sighted in the woods near the vicinity of the school’s grounds. In a Level 1 Lockdown, all exterior doors are closed and students and staff are kept safely indoors. All students and staff are safe. Police officers and RTSD security are at the school to provide assistance. We will keep you updated as additional information becomes available. Thank you. A noted posted to the Ithan Elementary School website Tuesday afternoon said police and game commission officers had completed a "thorough investigation of the wooded area on the perimeter" of the school's campus without finding the bear. Radnor Police are confident our students are safe and our property is secure ... A member of the RTSD security staff will supervise the area where the bear was sighted for the rest of today as well as all day tomorrow. We will also have security staff on hand to help with dismissal. A Radnor police officer will be here tomorrow to provide an extra layer of security. The police are also shutting down the township's two pathways that lead to the wooded area for 24 hours. Ithan Elementary officials already have rescheduled the school's back-to-school family picnic, which was to be held Tuesday evening for Wednesday. The change was made "out of an abundance of caution due to the bear sighting," said Michael Petitti, Radnor Township School District spokesman said. Residents in the 400 block of Round Hill Road in the St. David's section of Radnor spotted a large black bear Saturday night and notified authorities. Township residents are asked to stay away from the bear if they encounter it and contact authorities at 610-688-0503. • Make sure all trashcan lids are tight, remove bird feeders and cover all outdoor grills. • Keep your dog on a leash if a bear is active in your area. • Turn on outside lights and make noise when walking pets after dark. • Keep your pet in the house after dark. • Don’t leave small pets outside unless you are present. • Feed your pets inside. If you must feed them outside, remove their dish and clean up afterwards. Store food and other attractants in animal-proof containers with locking lids. • If a bear attacks your pet, do not attempt to separate the animals. Make loud noises by shouting and clapping and, if available, spray the bear with a hose or throw objects at it while maintaining a safe distance. Once the bear leaves, retrieve your pet and leave the area. If your pet is injured, call your veterinarian for advice on effective treatment. Also, immediately contact your state wildlife agency, which will assess the threat and take appropriate action. • If you come upon a bear or any wild animal for that matter, do not approach it for any reason. Go here more information about black bears and safety tips.